Remittances are required each month. We are happy to accept post-dated cheques. Please download, complete and print your remittance form to send with your cheque in the mail. If you have a member, the Member ID must be included. If there is no member at your congregation, just leave this section blank. A reminder that cheques cannot include funds meant for Presbyterians Sharing. A separate cheque is required. If you would like to save on postage costs, both cheques can be mailed in the same envelope. Each year, the General Assembly approves the Minimum Stipend and Allowance Schedule and sets the annual Maximum Qualifying Income (MQI). Member pension and group life insurance contributions are calculated according to the annual MQI as described in the following worksheet and information memos. Our Financial Services department has prepared a Handbook for Congregational Treasurers. 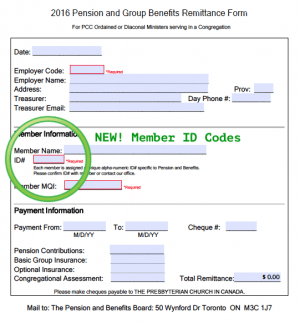 Pension and Benefits information can be found on page 15. The Pension and Benefits Office is pleased to host online learning opportunities throughout the year. These webinars are free to join and are one hour in length. All webinars are recorded and posted to our website after they are complete. If you have any questions regarding previous or upcoming webinars, please contact our Communications Coordinator – 1-800-619-7301 ext 230. This webinar will go over basic treasurer duties related to pension and benefits tasks. Together we will go over how to properly remit pension and group insurance funds to the pension office, how to calculate your member’s pension and group insurance deductions, congregational assessments, and answer frequently asked questions from treasurers. Treasurers’ Bulletins are sent out throughout the year to keep our valued congregational treasurers informed. Reminder that Annual Pension Plan Congregational Assessments will be sent in October. Congregations may apply for pulpit supply insurance where a professional church worker has been established by its Presbytery. Pulpit supply insurance is paid when the professional church worker is unable to work due to illness or accident. Pulpit supply insurance provides $150 plus travel ($25) per Sunday for a maximum of 17 weeks. Congregations may apply for maternity or parental leave reimbursement when a member of the group benefit plan claims maternity or parental leave top-up. Maternity and Standard Parental Leave – Top-Up Claim form – For employees taking a maternity or standard parental leave. Extended Parental Leave – Top-Up Claim form – For employees taking extended parental leave. We are always striving to ensure that you have all the information you need to do this important work. Want to receive all the latest news and updates regarding the PCC Pension and Benefits Plan?